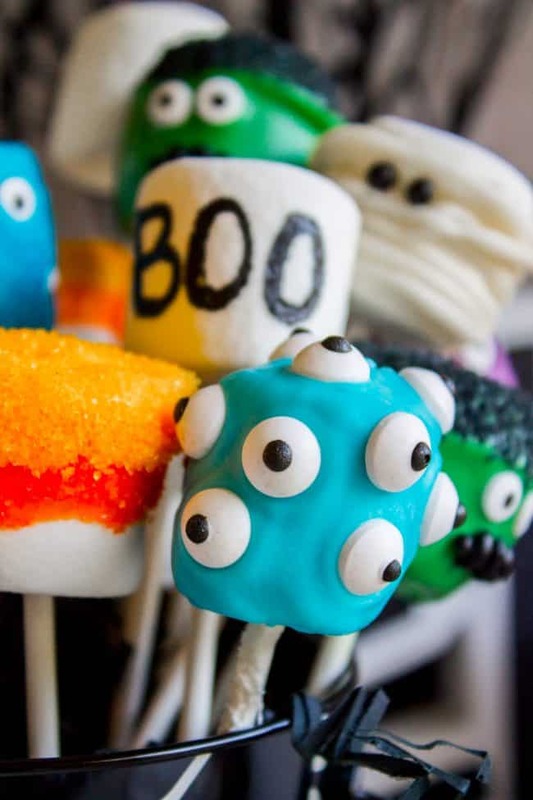 Marshmallow pops are about 100x easier to make than cake pops, and so festive for parties! Skip the baking and get to the fun dipping part. Frankenstein, ghosts, mummies, oh my! 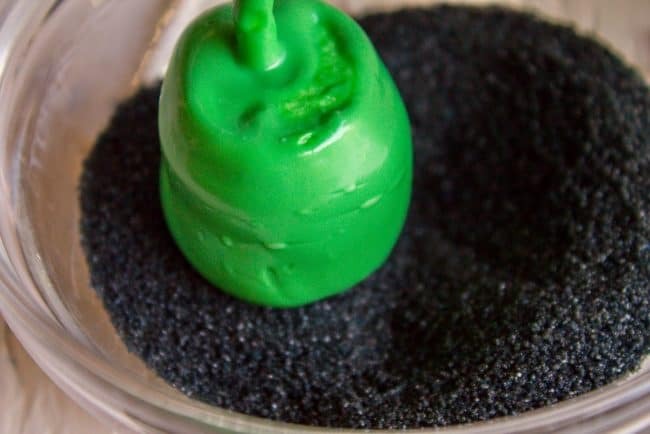 Your kids will love this easy Halloween project! Charlotte wants to be Marie Antoinette for Halloween. I have no idea how a 7-year-old even knows about Marie Antoinette, but now I’m trying to figure out how to break it to her that poor old Marie’s ending was, well, what shall we say, cut short. We bought a wig and a French dress. (ok so it’s a princess dress. Turns out they don’t make reasonably priced vintage Rococo Victorian dresses in her size, go figure.) I’m planning on powdering her face to be super white, but I’m still not sure people will know who she is. What else can I do? Have her carry around a cake?? Let them eat cake! Or let them eat marshmallow pops?? That’s more like it, especially since it’s Halloween, the time for loads of excess sugar in addition to all the candy your kids will be eating. See these Reese’s Stuffed Brown Butter Brownies for reference. Gosh I love this time of year. 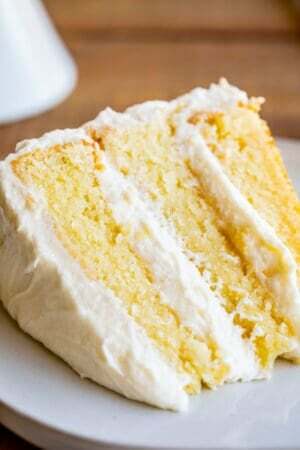 You don’t have to bake a cake and mash it with frosting. Although that is delicious, we don’t have time for that today. Children all through the land will adore you when you present them with food they can eat on a stick. Guys, I am the worst at crafty decorative stuff. I know you’re looking at pictures of pretty marshmallow pops and thinking “she’s crazy” but I’m telling you, I did not get that girly-everything-I-touch-looks-pretty gene. The fact that these look halfway decent is proof that this is an easy project that everyone can do. You will have to make a trip to a craft store like Michaels. Or sometimes Walmart will have everything you need. I like to melt my candy in mugs. That way you can dip the marshmallow all the way in instead of having to roll it to coat. But bowls will work fine too. Be sure to dry completely before re-dipping. Here’s Frankenstein getting his hair done. How long do Marshmallow Pops last? 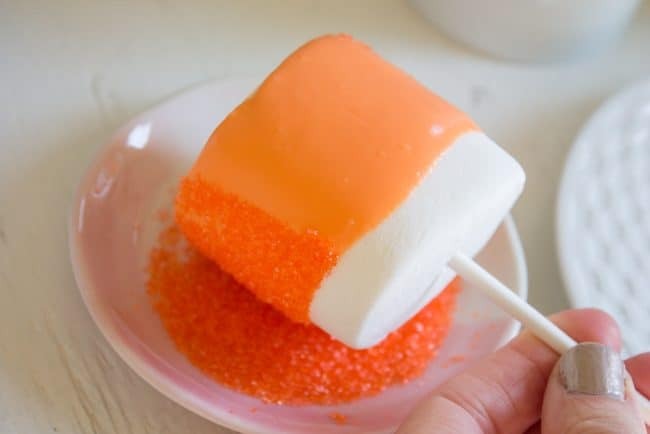 I love making treats like marshmallow pops for class celebrations or kid parties, because they can either be served right away, or wrapped up and completely ready to go ahead of time. 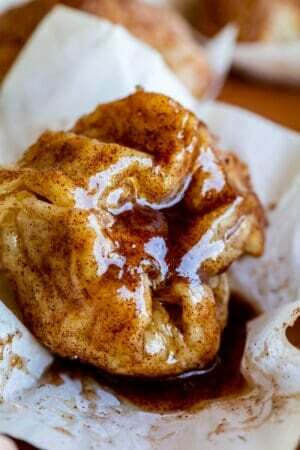 I would say shoot for making these about 24 hours ahead of when you are going to be serving them, but if you are in a pinch you can do them 2 days in advance (48 hours). After that they will start to get stale. 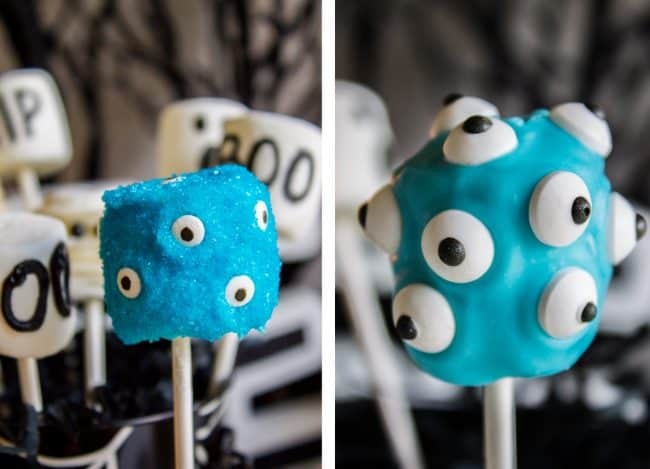 These would make great Halloween party favors to hand out for guests to take home. You can buy those tiny bags and twist ties at a craft store like Michaels or Hobby Lobby. It would also make a really cute table centerpiece. 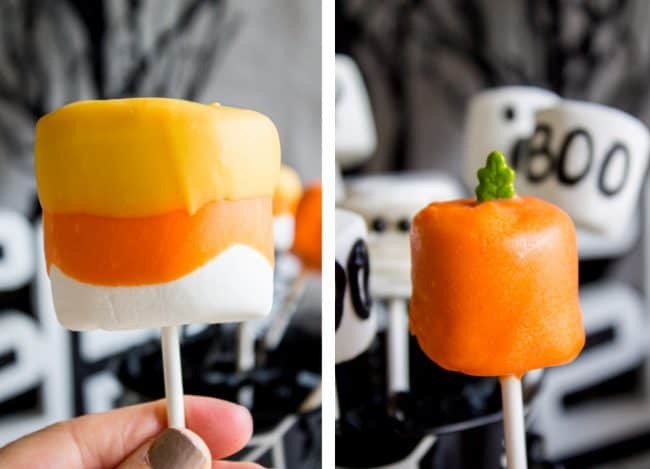 Marshmallow pops are about 10x easier to make than cake pops. Skip the hard part and get to the fun dipping part! Frankenstein, ghosts, mummies, oh my! Your kids will love this easy project! 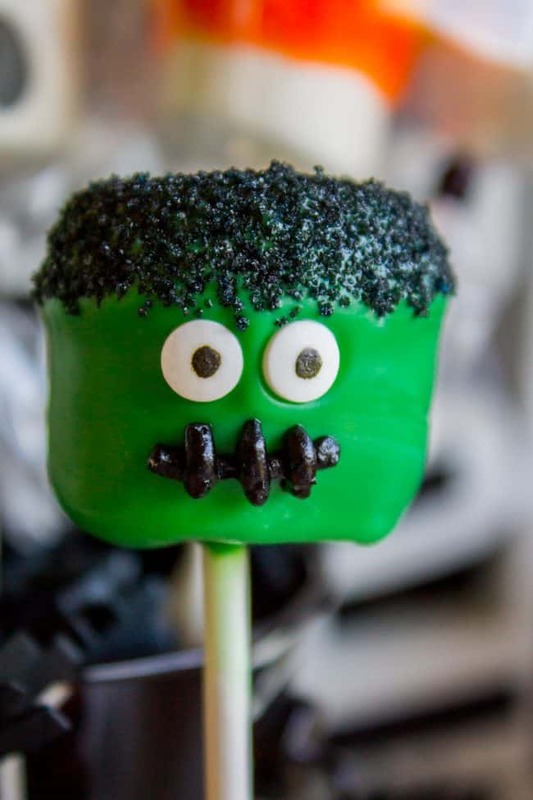 To make Frankenstein: Dip the end of your lollipop stick into melted green candy melts, then gently push into the bottom of a marshmallow. Dip the mallow into the green candy and cover completed. 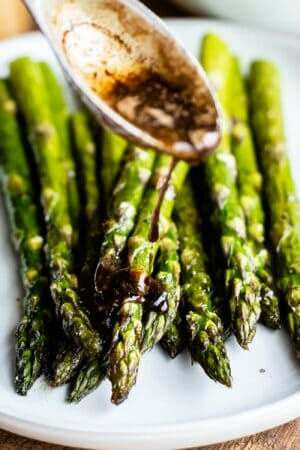 Shake off excess as best you can, then dip the top into black sanding sugar. Press two candy eyes into the side. Use your finger to remove the excess candy on the stick. 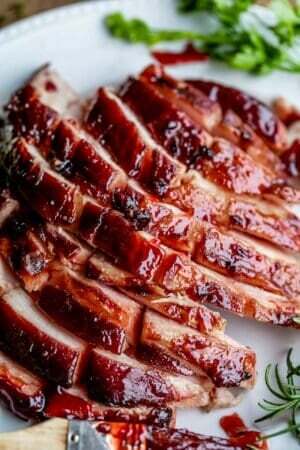 Let dry completely (you can stick it in the fridge, it will only take a few minutes.) 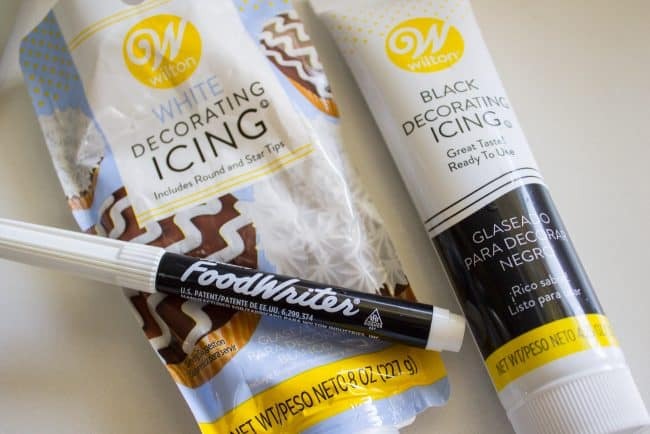 Use black decorating icing and a small tip (I think I used tip #4) to draw the mouth. To make Mummy: press the end of the stick into the marshmallow. Apply white decorating icing while spinning the marshmallow to go all the way around. It's okay if you have to stop and start again, mummies are the living dead, do you think their wrappings are perfect?? Add black nonpareils and let the frosting set up in the fridge. 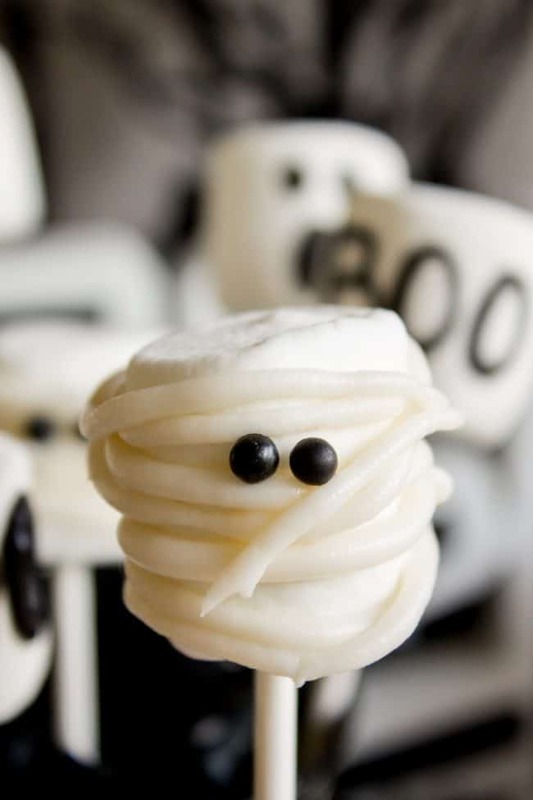 Note: The icing on the mummy is a little fragile, so it might not be the best one to do if you are planning on wrapping them individually. 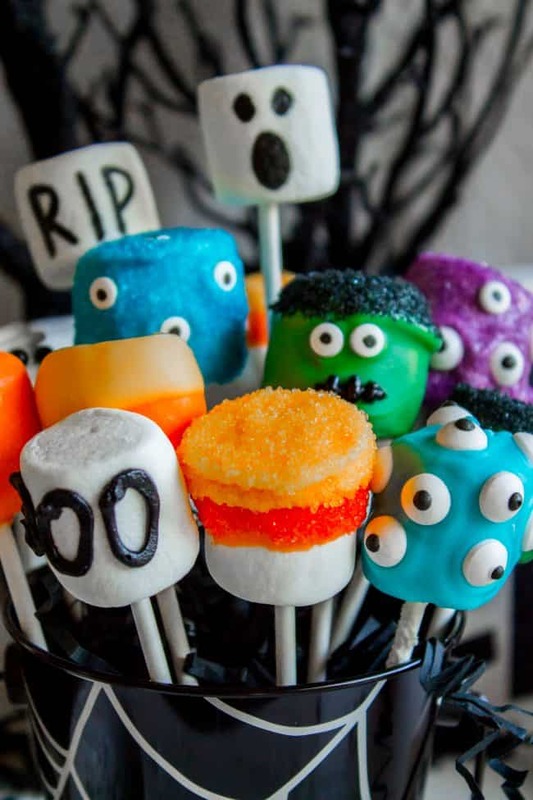 To make Monsters: Dip the end of the lollipop stick into the color of candy melt that you are using. Push it gently into the marshmallow. 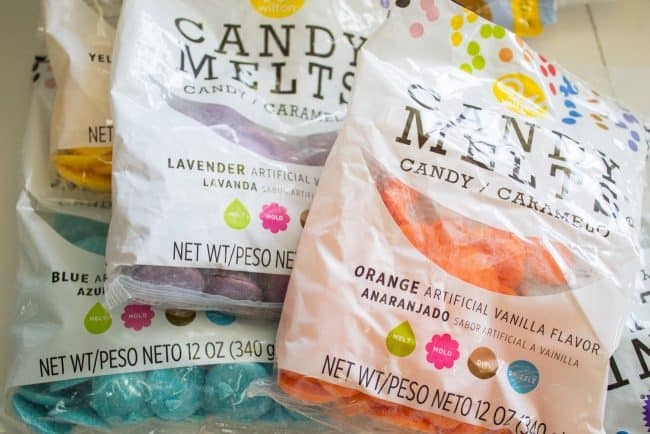 Dip the mallow into the candy melt and cover completely. Tap off the excess and use your finger to remove the excess candy on the stick. 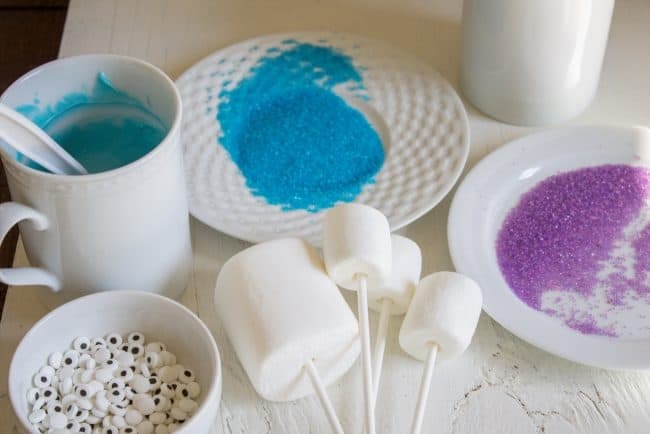 If you are using sanding sugar, gently press the top and sides of the pop into the sanding sugar. Add candy eyes. Let dry completely. 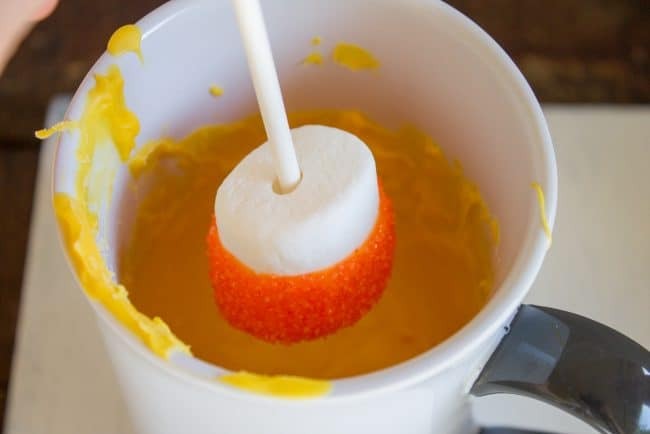 To make Candy Corn Pops: Press the stick gently into the marshmallow. Dip the mallow 2/3 of the way into melted orange candy melts. If you are using sanding sugar, press it into the orange sanding sugar now (don't bother doing the top, just the sides.) Let dry completely. Dip the top 1/4 of the mallow into yellow candy melts. Press the top and sides into yellow sanding sugar. Let dry completely. 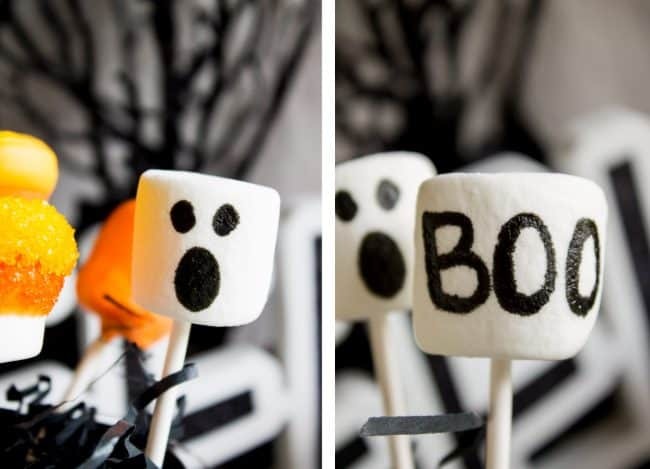 To make Ghosts: Use a black edible marker to draw 3 ovals on a marshmallow: 2 eyes and a big mouth. 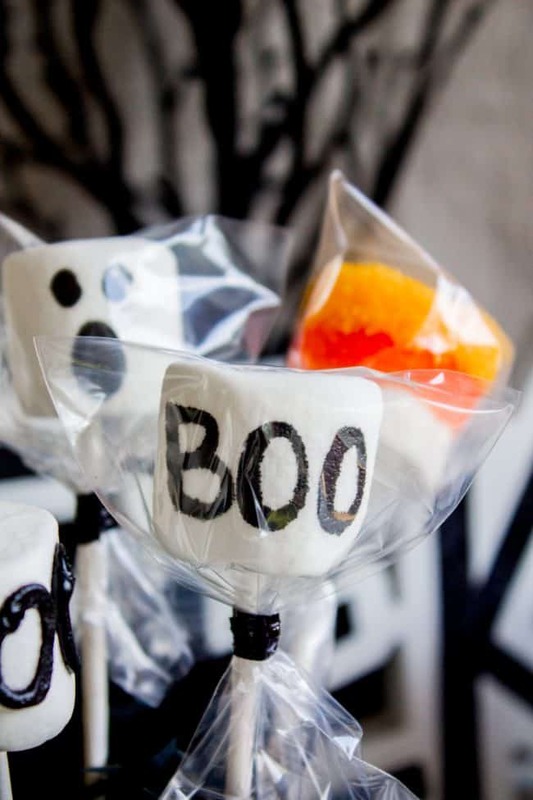 To make BOO, RIP: Use a black edible marker or black decorating icing with a very small tip to write on the marshmallow. To assemble: Place a block of styrofoam in the bottom of a decorative bucket, basket, or whatever container you want to use. (A cauldron or a plastic jack-o-lantern would look cool) Cover it with paper shred or something similar. Place each marshmallow into the styrofoam so that it is firm. 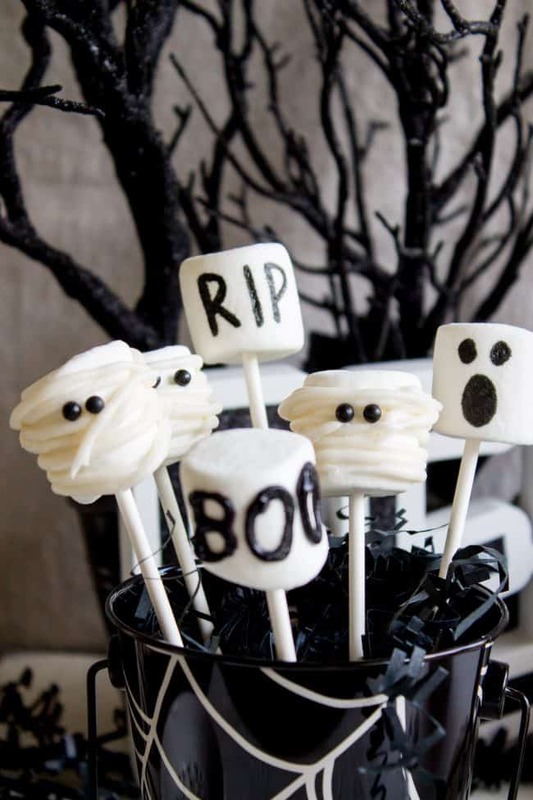 To assemble as party favors: Follow the method above, but first wrap each marshmallow pop in a small treat bag and tie off with twist ties, ribbons, twine, etc. *You could also try using paper straws. 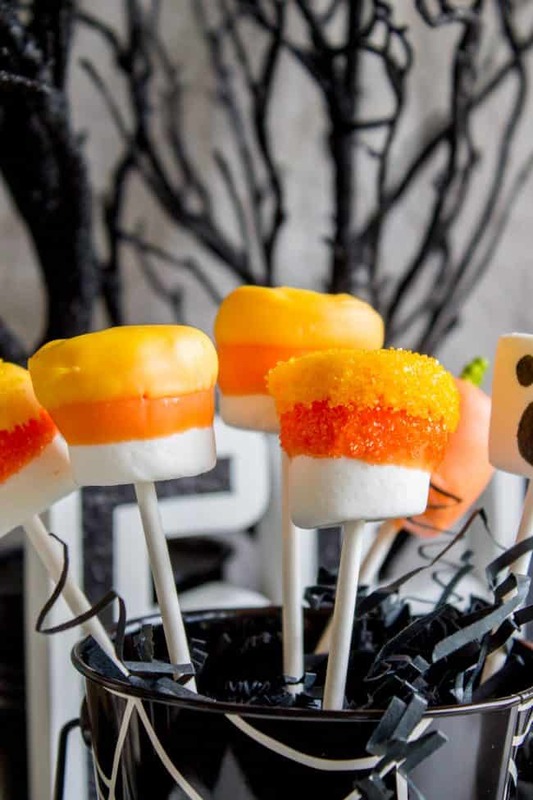 Are you in charge of bringing treats for a Halloween party?? Check out these other ideas! 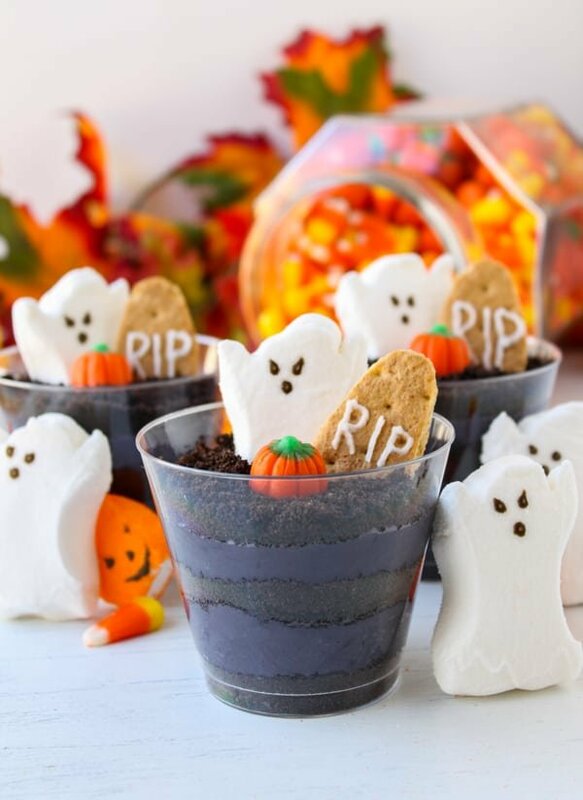 Halloween Cheesecake Parfaits << these are so good and SUPER easy. 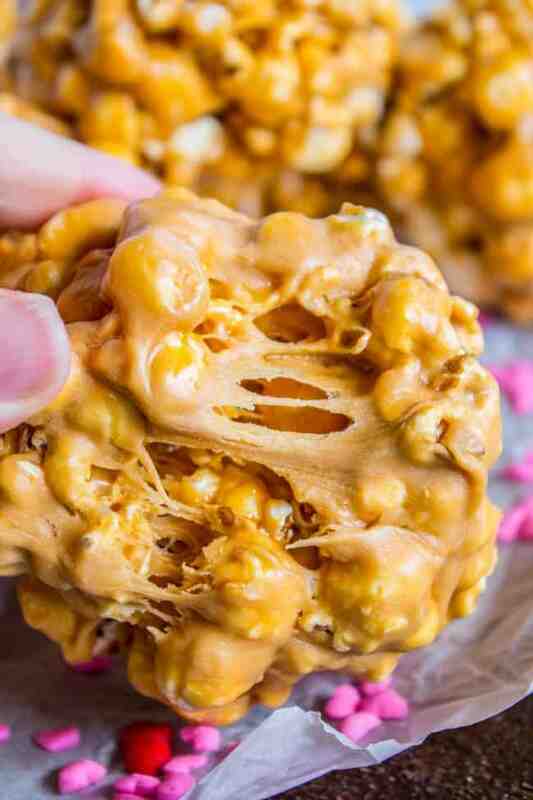 Butterscotch Popcorn Balls << am I the only one who feels like popcorn balls are definitely a Halloween thing? They would be so fun to bring to a class party. 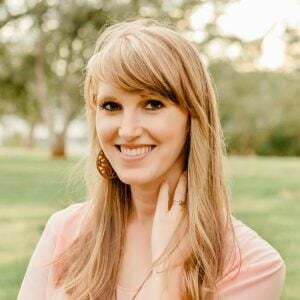 More fun pop ideas from other bloggers! These are so cute karen! 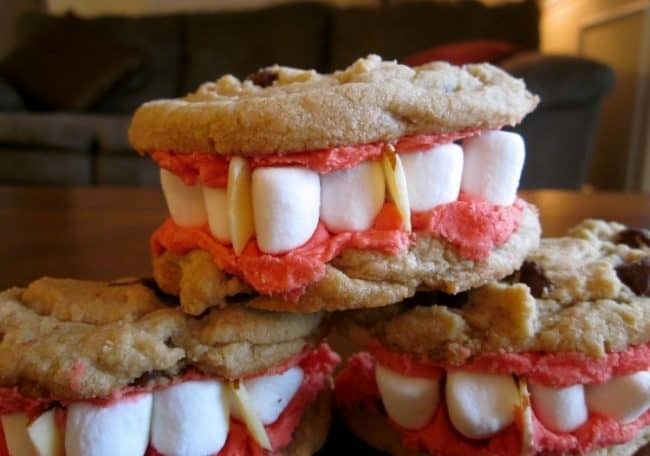 I might make them for my Halloween party! And you are craftier than I thought 😉!